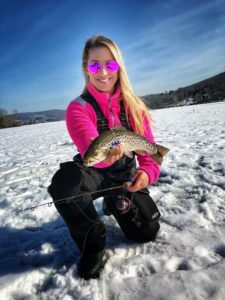 When she talks about the smallmouth bass in Candlewood Lake, Connecticut, Andrea Nivolo (@TheBlondeAngler on Instagram) gets wistful. It’s been a long (long!) winter in New England. Even so, Andrea is getting ready for open-water fishing. Now Andrea — along with her closest fishing buddies, her husband (a game warden!) and brother — is chomping at the bit to get back out on Candlewood. Andrea is a big believer in fishing as a way of creating family bonds. She and her brother spent many childhood summer days on their parents’ 30-foot fishing boat. It was slipped in Snug Harbor, Rhode Island, from where the family fished saltwater tournaments on weekends. After her parents sold the boat and built a new house, Andrea made the switch to freshwater. Even then, the family fished together. Eventually, Andrea became an EMT, and then a paramedic. She spent sixteen years serving communities in emergency services. During that time, she relied on fishing to relieve some of the stress inherent in her line of work. A few years ago, she and her brother started fishing together in a canoe that he’d recently purchased. Not only did fishing together make their sister-brother bond even stronger, it also fanned the flames of Andrea’s angling passion. Meeting her husband, Jesse, an avid angler as well (they met at a Bass Pro Shop), also expanded Andrea’s fishing horizons. He’s an avid trout angler and she’s all about that bass (see what I did there?). She put him on his first smallmouth, and they chased cutthroat trout on their honeymoon last year. But the stretch of the Snake River — near Jackson, Wyoming — that they wanted to fish was fly-only. Andrea had never fly-fished before. So, she got her first fly rod and reel on her honeymoon. Andrea also managed to net a 20-inch cutthroat on the fly. As incredible as she found the experience to be, trout aren’t going to put her off smallmouth anytime soon. Andrea’s passion for fishing extends beyond recreational angling. She’s also quite active in the local fishing community. 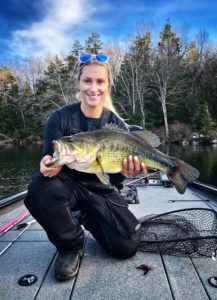 A few years ago, Andrea was featured on the cover of the state fishing guide, which “opened up a lot of opportunities” for her. She is a brand amabassador for Pure Fishing and works with Berkley and Abu Garcia. Andrea is also a C.A.R.E. (Connecticut Aquatic Resources Education) instructor. She visits classrooms and museums, and works at events like trout stocking programs, to get kids excited about fishing and connecting with nature. She is also interested in getting more women involved in fishing. “I want to help them feel important and less intimidated when they fish,” she says. But still, fishing is a deeply personal experience for Andrea. As important as the bonds that fishing builds are to her, Andrea also appreciates the serenity it offers — like a church.